Those on the hunt for truly impressive wine refrigeration units almost inevitably find themselves looking at a set up like this one – the Whynter Wine Cooler – not only because it offers incredible functionality and utility but also provides you with that kind of modern high-end aesthetic that so many people are into these days as well. 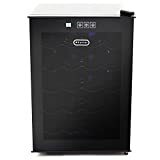 Elegant, easy-to-use, energy-efficient, and featuring the kind of capacity that you’d expect from a top-of-the-line standalone wine refrigerator, this is the kind of set up that serious wine enthusiasts would be happy to add to their home for sure! As we have touched upon above, the overall design and configuration of this particular wine refrigerator is absolutely second to none. It features a very clean, very modern, and very attractive aesthetic that would look at home in any high-end wine bar or restaurant while at the same time providing you with the kind of functionality and utility you’d expect of a top-quality home unit – one that won’t break your bank account when it comes to the energy bills. You’ll find getting your bottles into and out of this unit to be a relatively simple and straightforward process as well, and with ample storage and plenty of equal spacing for each individual bottle you’ll be able to keep them at a specific temperature and definitely with no trouble, either. 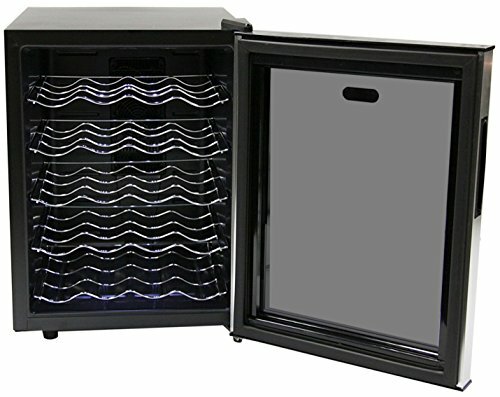 Available in a couple of different configurations, ranging from a 20 bottle configuration to a 33 bottle configuration – but also available in a variety of different metals and materials as well – the Whynter Wine Cooler is an elegantly designed system that will help you hold a pretty sizable wine collection at the ideal temperature with no real trouble, either. The rack design and storage for this unit is something that you are really going to appreciate, especially if you have used other wine refrigerators in the past (particularly high capacity wine refrigerators like this one) that can be a bit of a nuisance to use when you are looking to retrieve a specific bottle of wine in your collection. All of the bottles are on racks that pulled completely out of the refrigerator (individual racks on “shelves” so that you can select the row that you want to pull a bottle from) and all of these racks move about as smoothly as one could hope so that you don’t have to deal with any hassle or friction – even when they are fully loaded. Digital temperature control systems allow you to set your temperature range in this wine refrigerator from anywhere between 40°F and 65°F. All of the controls for modulating temperature are on the outside of the unit, which means you will be able to completely control and adjust temperature on the fly without ever having to open the unit itself – trapping all of that cold air exactly where you want it and not disturbing the temperature of the wine inside your fridge. Noise will never be a problem with the Whynter Wine Cooler unit. The entire temperature system is well insulated, not only to maintain energy efficiency but also to provide you with noise canceling technology. You may never even hear this refrigerator while it is in operation! A lot of people are nervous about investing in larger capacity wine refrigerators because of the potential for skyhigh energy bills associated with running them on a 24/7 basis. This particular unit isn’t going to break your bank account when it comes time to pay your energy bills every month, and utilizes heavy insulation – including double insulated glass on the doors – to provide you with the best energy efficiency possible. 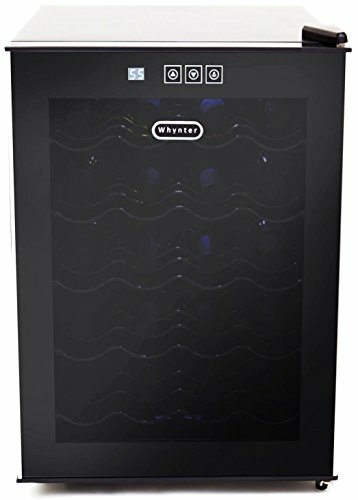 You won’t ever lack for choices when it comes time to find a quality wine refrigerator these days, but few of them (if any) are as complete and as well designed as this Whynter Wine Cooler is.